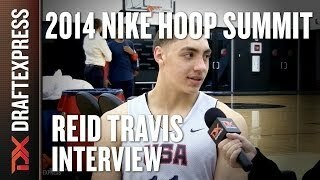 As Stanford's first McDonald's All-American since the Lopez twins, Reid Travis started his freshman season with high expectations. After a handful of promising performances during Stanford's out of conference schedule, an upper-leg stress fracture in January shortened what was ultimately an inconsistent freshman season. Still, Travis played a key role on a Stanford team that won an NIT Championship and showed flashes of developing into the type of player that made him such an attractive high school recruit. Expectations remain high, especially as video and reports from the Cardinal's summer trip to Italy suggest that Travis may be ready to turn the corner and deliver a breakout sophomore season. At 6'8 with a 241 pound frame and a 7'0 wingspan, Travis possesses a prototypical physical profile for a collegiate power forward. While he struggled at times athletically after his injury last spring, he looked quicker, more mobile, and more explosive in footage from Italy. In general, he appears to be a good, but not great athlete with the strength and length to stand out at the collegiate level. As a freshman, Travis was both a low usage player and one of the least productive power forwards in our database. He averaged 10.5 points per 40 minutes pace adjusted on sub-50% shooting, while posting double figures in just five of the 28 games that he played in as a freshman. Travis was rarely featured on the offensive end of the floor during his freshman season and struggled when he was asked to create his own looks. If he was not able to quickly turn the corner and get to the basket, his raw footwork limited the extent to which he could operate in the post, outside of simple spin moves and jump hooks. Furthermore, his overreliance on his right hand, his lack of a shooting touch, and his trouble finishing over taller and more athletic defenders resulted in an often-predictable, low efficiency back-to-the-basket game. He was far more effective, however, in non-post up situations around the basket, where he attempted nearly 60% of his shots and made 64.9% of these attempts. In fact, some of his best moments as a freshman came while cleaning up the offensive glass and catching and finishing around the basket. He also did a good job of drawing contact at the rim and he got to the free throw line 5.2 times per-40 minutes. Yet, he was also one of the worst free throw shooters in our database, making just 45.9% of his attempts once there. When coupled with the fact that he made just 3/16 of his jump shots, this suggests that he has a lot of work to do on his shooting mechanics, as well as his shooting touch more generally, moving forward. On the defensive end of the floor, Travis did a decent job in one-on-one post situations, but struggled at times making rotations, looking unfocused and displaying a tendency to drift off of his man toward the ball handler. The potential he showed in high school as a rebounder did not come to fruition as a college freshman at 9.4 rebounds per 40 minutes pace adjusted, which ranked in the middle of the pack relative to prospects in our database. He will have to be more aggressive on the defensive glass moving forward as Stanford's top interior option. Scouts will want to see better fundamentals and increased intensity during his sophomore season, as, his combination of length, strength, and mobility should pay dividends on the defensive end in time. Ultimately, Travis looks to be a long way from realizing his potential as a prospect still, which is not entirely surprising considering he's still only 19 years old. From an NBA perspective, he must continue to develop his footwork and post repertoire while showing scouts that he is willing to consistently hustle on both ends of the floor. In limited footage from Stanford's Italy trip, however, Travis looked more comfortable putting the ball on the floor and more confident as a finisher against a high level of competition, which suggests that he might look like a different player as a sophomore. He will have to be if Stanford hopes to weather what looks to be a transition season in Palo Alto. Without Stefan Nastic in the post, Travis should have plenty of opportunities to carve out a bigger niche for himself in the Cardinal offense, though whether he can put it all together as a sophomore, however, remains to be seen. - Runs the floor hard. Gets ahead of defense regularly. Outlook: Tyler Hansbrough esqe big man with good scoring instincts and an outstanding motor. The type of big man every college coach dreams of. Will need to continue to expand his game to attract the pro scouts, but can't be ruled out with his work rate and toughness.